Paul Manafort is the leading target of the Mueller investigation, apparently because he served briefly for several months as the campaign chairman for presidential candidate Donald Trump in mid-2016. Manafort has also been a lobbyist and political consultant. Manafort is a longtime target of Clinton operatives Mary Jacoby and Glenn Simpson. Jacoby and Simpson colluded with the Obama FBI and Justice Department to commit fraud against the U.S. Foreign Intelligence Surveillance Court and meddle in the 2016 Presidential election. Manafort was framed in an illegal information flow from FusionGPS to Bruce Ohr and Andrew Weissmann in the Obamagate FISA abuse scandal. During the 2008 Presidential election, Wall Street Journal correspondents Mary Jacoby.and Glenn Simpson reported that a consultant to John McCain hired a public-relations firm to improve the American image of a Ukrainian political party backed by Russian leader Vladimir Putin, according to documents filed with the Justice Department. Jacoby and Simpson reported "The lobbying firm of Davis Manafort Inc. arranged through an affiliate for the public-relations firm's work in the spring of 2008, at the same time Davis Manafort was being paid by McCain's presidential campaign. The firm is co-owned by lobbyist Rick Davis, manager of Sen. McCain's presidential campaign, and Republican strategist Paul Manafort." Mary Jacoby, the wife of FusionGPS founder Glenn Simpson, is the daughter of Jon Jacoby who arranged the purchase of an 80% share of Systematics for the Stephens family. Hillary Clinton was hired by Systematics in 1978 as their intellectual property lawyer. 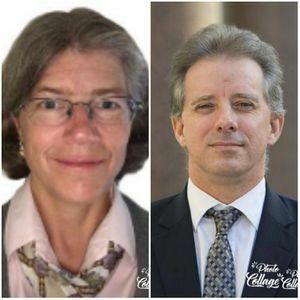 The intellectual property that Systematics claimed to own were pirated versions of the PROMIS software stolen from Inslaw, Inc.
Simpson hired Nellie Ohr (left) and Christopher Steele (right) to construct the phony Clinton-Steele dossier. Nellie Ohr is the wife of Obama Associate Deputy Attorney General Bruce Ohr. Bruce Ohr passed the phony dossier to the FBI, which then was used to justify inititiating an investigation of Trump associates and hoaxing the FISA court to issue surveillance warrants. The illegal evidence then was used by the Mueller team to indict Paul Manafort. Systematics at the time was acting as a front for the NSA, marketing the software worldwide to banks so the US intelligence community could monitor global money laundering transactions. FusionGPS was hired by Hillary Clinton to author the fraudulent Steele dossier which alleged Trump-Russia collusion. The day after FusionGPS lost its contractor access to the FISA database, Mary Jacoby attended a meeting at the Obama White House. Nellie Ohr and Christopher Steele were hired by FusionGPS to write the Steele dossier shortly afterward. The Steele dossier was used in the FISA abuse scandal. Additionally, FusionGPS's No.2 man, Neil King, Jr., is the spouse of Obama Senior Advisor Shailagh Murray. Robert Mueller (right) colluding with Ukrainian President Victor Yanukovich (left). Mueller served as an errand boy for Hillary Clinton to build goodwill with Vladimir Putin for the Russian Reset. The Russian Reset was a pause in tensions for the Uranium One deal. The Clintons personally took $500,000 from Russian oligarchs in the Uranium One bribery scandal, which Mueller likewise had to sign-off on. During the Republican National Convention in 2016 Anne Applebaum of the Washington Post wrote a piece entitled, Trump presidency could destabilize Europe. The issue, she explained, was Trump's positive attitude toward Putin. “The extent of the Trump-Russia business connection has already been laid out, by Franklin Foer at Slate,” wrote Applebaum. She named Carter Page and his “long-standing connections to Russian companies.” Applebaum repeats the debunked notion that the “Trump’s campaign team helped alter the Republican party platform to remove support for Ukraine” from the RNC platform. Maybe, she hints, that was because of Trump aide Manafort's ties to Ukrainian President Victor Yanukovich. The Manafort-Yanukovich relationship is an important part of the Steele dossier. So is the claim that in exchange for Russia releasing the DNC emails, “the TRUMP team had agreed to sideline Russian intervention in Ukraine as a campaign issue.” For Applebaum, it was hard to understand why Trump would express skepticism about the North Atlantic Treaty Organization, except to appease Putin. She referred to a recent interview in which Trump “cast doubt on the fundamental basis of transatlantic stability, NATO’s Article 5 guarantee: If Russia invades, he said, he’d have to think first before defending U.S. allies.” The talking points come directly from Hillary Clinton's opposition research, FusionGPS and the Steele dossier. In 2017 Manafort was indicted by Special Counsel Robert S. Mueller in the Trump-Russia scam. Manafort was indicted for FARA violations and influence peddling in conjunction with the Podesta Group. The activities took place primarily during Hillary Clinton’s State Department years. Nothing in the indictments related to President Trump. On February 22, 2018, a grand jury issued a superseding indictment for Manafort and his deputy Rick Gates. The superseding indictment does not include any reference to the Trump campaign, including no mention of collusion, coordination, or conspiracy between the Trump campaign and the Russian government. On September 14, 2018 Manafort plead guilty in money laundering and tax evasion schemes while employed by Sen. John McCain. ↑ According to The American Lawyer, July 1992: "[Hillary] Clinton also was attracted to intellectual property litigation. 'We did not have any intellectual property expertise when she joined us,' says Vince Foster, who adds that Clinton got involved in this area through her work for the firm client, Systematics Inc., a company based in Little Rock that provided computer systems for financial institutions. 'She became sort of self-taught in all of this,' explains Foster. 'And you don't find a lot of intellectual property subspecialists in Arkansas. Quite frankly, the rest of us here thought of it as a foreign language.'" ↑ The Oil Card: Global Economic Warfare in the 21st Century, James R. Norman, Trine Day, 2008. This page was last modified on 30 January 2019, at 19:35. This page has been accessed 4,813 times.